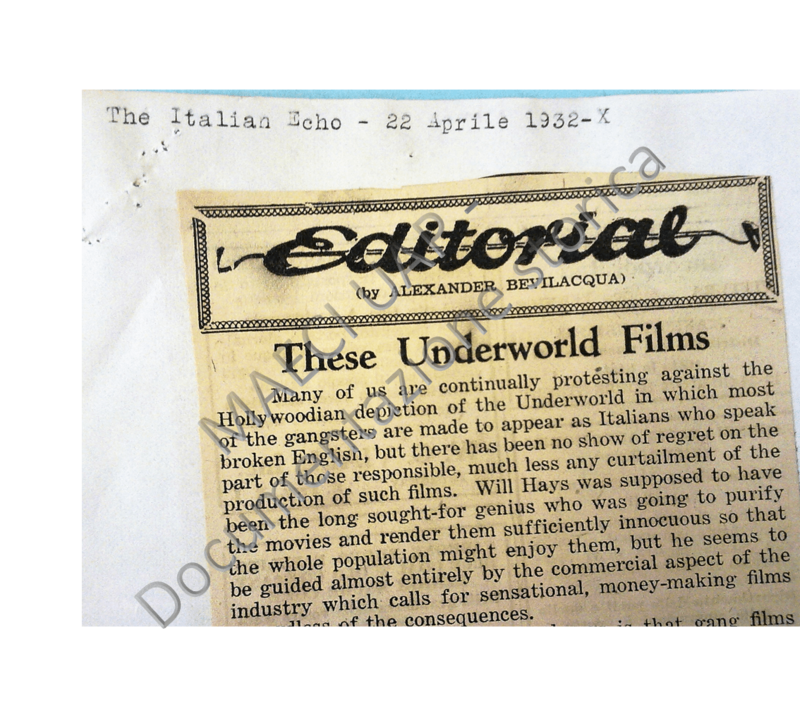 In the spring of 2014, the British Academy and the Leverhulme Trust awarded a small research grant to my project entitled “The Language and the Image of a Nation: Diplomatic Relations between the Italian Foreign Office and the Motion Picture Producers and Distributors of America (MPPDA) during the 1930s”. The scheme is notoriously very competitive, so when my project was selected, I couldn’t quite believe it. I stayed in Rome between September 2014 and March 2015. From September to December, I visited the MAE archive; between December and March, I mostly worked at the ACS. These two state archives are located in two different areas of Rome. The ACS is located in the South West, in the wealthy EUR district, only a 5-minute walk from the Laurentina stop of the Metro B line. The journey to the MAE archive, located in the North West, is not as straightforward. Because I visited the archive before during my PhD, I was aware that this area, and Rome in general, is not often serviced well by public transport, and if I wanted to commute easily to the various archives and libraries scattered around the Eternal City, [ii] I needed to stay somewhere not too far from Termini Central Station, where the two main metro lines A and B intersect. I was lucky to share an apartment near San Giovanni, which is served by the Metro A line and only a couple of stops away from Termini. MAE’s historical diplomatic archive is open to researchers only between 9:00 and 14:00, Monday to Friday. To get access researchers need to make an appointment through the online system, submitting copy of their ID and a reference letter from their supervisor/mentor/funding body. Citizens of foreign countries are required to submit further documentation as to why they need to carry out research in Italy. They will also likely need to have some knowledge of Italian or work alongside someone who does when making their application and during their time at the archive. The entrance to the archive is on the left side of the Ministry’s imposing building. Upon my arrival, I reported to reception and then went through security and bag checks. Once inside, I was asked to leave my belongings in one of the small lockers outside of the reading room. I was allowed to bring my own laptop, phone, notebook, camera (or scanner) inside the room. Personal reproduction is free but previous authorization is required. There is also a photocopying machine, but it can’t be used if records are in poor physical condition (and if working on pre-WW2 collections, it is likely that they are dusty and/or have deteriorated). The ACS is open to researchers Monday-Friday 9:00-18:45 and Saturdays 9:00-13:00. A photo ID will be required each day to access the reading room, and small lockers are available on the ground floor. On the first floor, first-time visitors will need to register and to briefly describe their research. Photocopying and photography are allowed but at a fee set by the archive. Inside the building there is only a small area with a few vending machines, but the outside area is better served if one is in need of a short break. During my time at MAE’S archive, I collected textual evidence of a diplomatic dispute between Italy and the United States concerning film trade. The production by US film companies of films spoken partially or wholly in Italian and which portrayed characters of Italian heritage and/or episodes and figures from national history – such as, for example, Scarface (1932), Farewell to Arms (1932), Idiot’s Delight (1937) – triggered a remarkable exchange of correspondence between the two countries: Rome accused the North American film majors of insulting the prestige and the dignity of the Italian nation and people, repeatedly requesting through the Italian embassy in Washington (but also drawing the large Italian diplomatic network in the US and across the world into the dispute) a halt to the production and the international circulation of any film which could offend Italian sensibilities. The Hays Office, alongside the US State Department, communicated regularly with the Italian Office via Washington and New York to reassure the Italian government of their intention to treat any foreign background sympathetically as to avoid disturbing in any way “the progress of international amity”. The Italians were not the only ones whose complaints the MPPPDA had to deal with ̶ the Mexicans and the French, for example, also protested strongly against Hollywood’s negative stereotyping and inaccurate historical portrayals (one can read more on the subject in Ruth Vasey’s pioneering The World According to Hollywood 1918-1939). MPPDA’s contacts with Italian officials in the US were generally very amicable. Consuls, ambassadors and representatives of the film industries occasionally met to discuss office matters, but also for private film screenings, dinners and other social outings. Aside from some occasional unresolved episodes of friction, mostly caused by Rome’s unabashed political interference in Hollywood’s business, this seemingly cordial relationship lasted until 1938, when the majors embargoed the Italian market in reaction to the fascist monopoly laws of the same year. 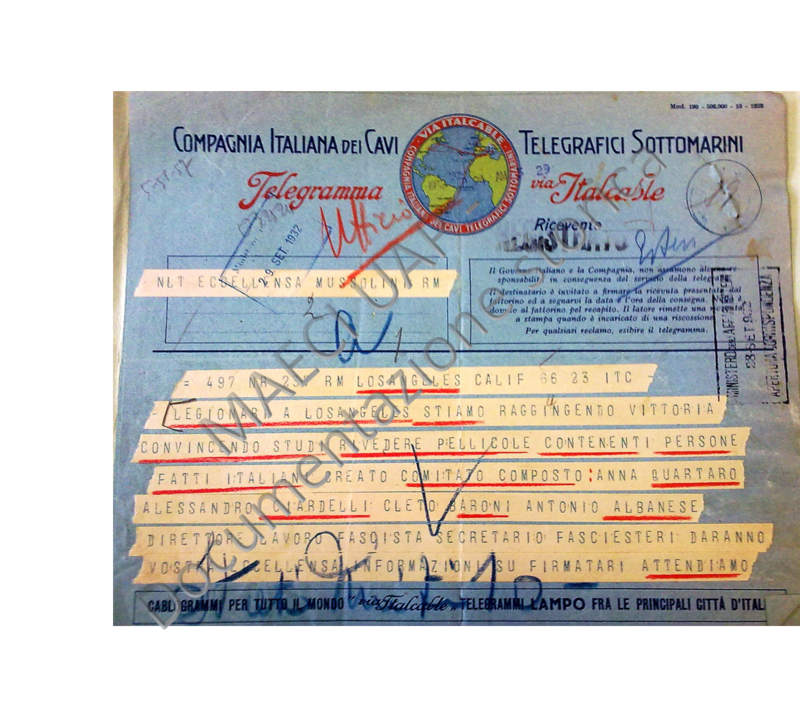 The ACS conserve rich documentation related to the development of the Italian film industry under Mussolini, such as, for example, finance and legal documents attesting to the state’s involvement in the film industry, correspondence, screenplays and photographs. I was interested in providing textual evidence for Mussolini’s infamous decision to silence and later ban from theatrical distribution early sound films spoken in a foreign language. I was also looking for further examples of state censorship to complement the data that I previously collected at MAE and during my PhD at the Italia Taglia archive of the Ministero per i Beni e le Attività Culturali e il Turismo (MiBACT) [Ministry of Cultural Heritage and Activities and Tourism]. Other interesting archival records were also discovered serendipitously, such as evidence of the cordial relationship between Mussolini and US film companies such as Fox and Columbia, or correspondence discussing the organisation of the dubbing industry in Rome in the 1930s. However, research into materials that interested me was not as straightforward as that at MAE. Several hours were spent inspecting the existing ACS catalogues for relevant information. A systematic enquiry into their vast collections was significantly complicated by the fact that documents related to the development of the Italian film industry and to the political personalities involved in the film trade 1) are not always inventoried/catalogued; 2) are sometimes missing from the folders; 3) appear erratically under different offices such as the Ministries of the Interiors, of Corporations, of Trade, of Finance, of Press and Propaganda, of Popular Culture, as well as in the Duce’s Office, the State Press Agency Stefani, the Office for Propaganda abroad and so on (including respective sub-offices!). 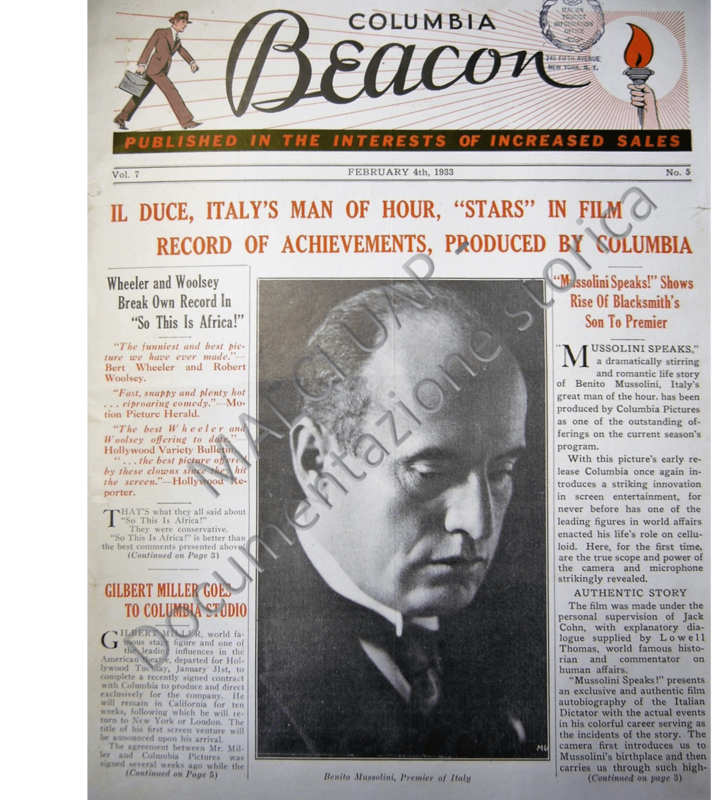 Research into the textual records of MAE and ACS expanded my existing knowledge of the relation between the fascist Italian government and the US film industry between the two world wars. It also enriched my understanding of the inner workings of the Foreign Office and of the role that ambassadors and consuls played in the international traffic of films. Some of the archival findings have since found their way in my first monograph, while others are forthcoming in chapters published in edited books. A case study on 1932 Scarface can be found here. [i] The project also allowed for a period of research in Los Angeles (the Margaret Herrick Library, UCLA’s Film and Television Archive and the Warner Bros. archive). [ii] I also visited the National Central Library, the Biblioteca Alessandrina, the Biblioteca Luigi Chiarini of the Centro Sperimentale di Cinematografia and the Cineteca Nazionale. Carla Mereu Keating obtained a PhD in Italian from the University of Reading (UK). She currently holds a British Academy Postdoctoral Fellowship in the School of Modern Languages at the University of Bristol (UK). Her research project investigates Hollywood’s film translation industry and the introduction and developments of dubbing in Europe. She has published several articles on media translation history, censorship and ethnicity and is the author of The Politics of Dubbing. Film Censorship and State Intervention in the Translation of Foreign Cinema in Fascist Italy (Peter Lang, 2016). She co-organises Migrating Texts, an annual series of seminars and masterclasses exploring subtitling, translation and adaptation.